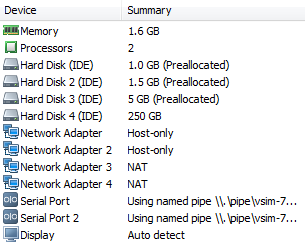 An interesting little problem when I decided to add additional Network Adapters to a Virtual Machine in VMware Workstation. The Virtual Machine had no problem starting with the original hardware as below. Note: If you’re having problems, try typing out the above – sometimes the formatting's out if you copy and paste! 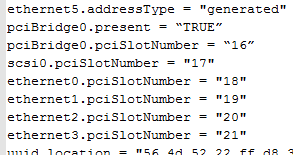 – before the line scsi0.pciSlotNumber = “16”, and then increment all the pre-existing pciSlotNumber entries by 1 (so they are consecutively numbered) like in the image below. Note: ethernet4 and ethernet5 will auto generate on boot. Excellent! my problem was not exactly mine and had to delete a whole unused device but this was the key. thanks! This worked for me... Thanks a lot! Thanks for post, saved me time. Cheers! This works on ESXi 5.1 as well. Thank you for your post! It fixes my issue with CDOT 8.2.1 Simulator that adds 2 additional NAT NICs for a total of 6 NICs. Until now it appears to be working well. Many thanks for the comment Iceman.